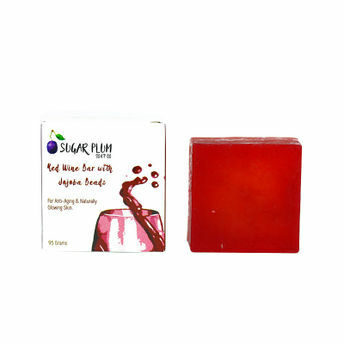 Embrace this soap bar enriched with red wine and jojoba beads and bid goodbye to ageing skin! Sugar Plum Soap Co. Red Wine Bar with Jojoba Beads contains some of the best natural remedies for ageing and sagging skin. Be it red wine, aloe vera, geranium oil or jojoba seeds, every ingredient in this oil works towards giving you a beautiful younger looking skin. This soap contains anti-inflammatory properties, which makes it perfect for acne-prone skin. This red wine bar transforms dull complexion and lends you a natural glow. Jojoba seeds are natural exfoliants that can be used on sensitive skin for their spherical shape. They also share a similar structure just like our skin's natural oil. This bar gives you a naturally glowing skin along with great anti-ageing properties. Explore the entire range of Soaps available on Nykaa. Shop more Sugar Plum Soap Co. products here.You can browse through the complete world of Sugar Plum Soap Co. Soaps .